A much needed 6 points and a creditable draw away against Liverpool leaves us 3 games unbeaten and 7 points from a possible 12 in December alone. Although this looks positive, I think I’m not the only one that thinks the draw was a positive performance but still 3 points is 3 points and I’m pleased regardless. Wins against these teams, especially during this time of the season, are vital to fighting relegation. Away seating: In the North Stand, up to 2,000 capacity for away supporters. The views and leg room are fantastic for an away end, the concourses are also said to be spacious and have good pre-match and half-time entertainment. The away fans are separated from home fans by metal barriers with police and stewards also providing a separation. 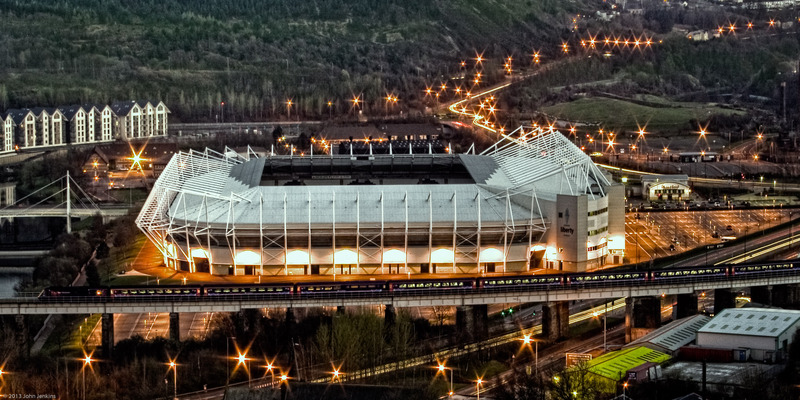 A new stadium built on the former site of Morfa Athletics Stadium (hence the address) on the west side of the River Tawe at a modest cost of £30m. Trains are not running due to it being boxing day and many railways are undergoing engineering work. However, for future reference, the closest station is Swansea Railway station on the main line route from London Paddington. No bus services will be running on Boxing Day. The drive from the Olympic Park in Stratford is 3 hours and 54 minutes via the M4 (this does include toll roads). It is advised to follow your sat nav with the postcode mentioned above (SA1 2FA). Alternative routes include going via the M4 and A40 which will take 4 hours and 14 minutes. The club are also running a coach service, which it would be advisable to have booked to take the strain off you. As expected, most of the parking around the stadium is for resident permit holders only. 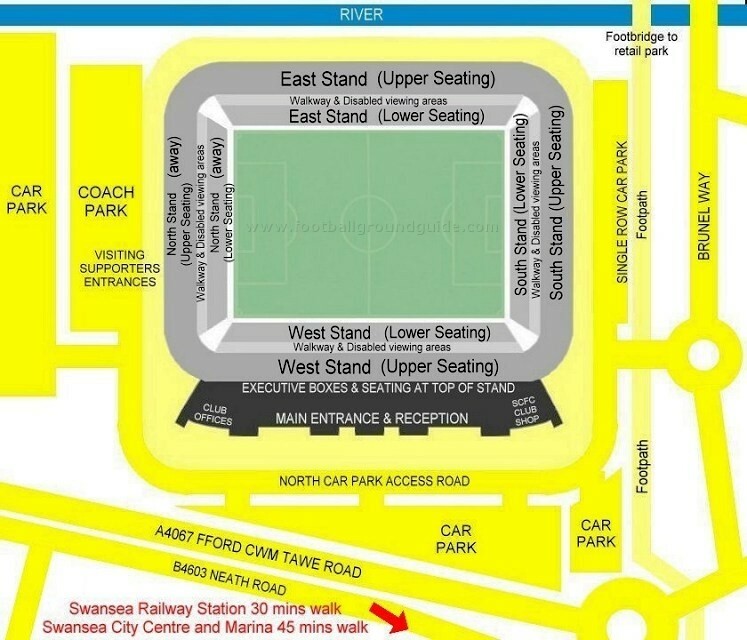 Away mini-buses and coaches can park behind the North Stand, where you will be sitting, in a fenced off area at a cost of £20 for a coach or £10 for a mini-bus. It is advised against parking at the retail park nearby because you could end up with a ticket or be clamped, which could either dampen a great day or make a bad day worse. There is a park and ride facility located at Felindre old steel works site. This appears on signs off Junction 46 shortly after leaving the M4. 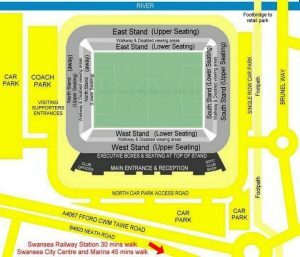 It costs £6 to park there per car and away supporters have dedicated buses to and from the stadium. Buses wait after the game to take you back to your car. Due to being located close to a retail park, there is a Harvester and Frankie & Benny’s located just outside and a couple of pubs at nearby Llangyfeleach Road. Some pubs are mixed fans, but it is reported that the fans are friendly enough to chat with and mingle with (don’t take my word for it!). The Railway Inn on Siloh Road should be avoided by away fans, however. Carling and Worthington bitter are served within the stadium, which opens 90 minutes before kick-off so that you have the option to eat or drink within the stadium rather than outside. The official programme of Swansea City – called Jack Magazine – costs £3. The ‘Swansea Oh Swansea’ and ‘A touch Far Vetched’ fanzines cost £1 each if you are more interested in fan produced programmes. Please be safe, enjoy the game and make the most of your day out in Wales. As normal, @WestHamWaycouk will be posting updates throughout the game or you can get involved on our forum!